The Bath Guitar Festival and Summer School returns to the glorious world heritage site of Bath from the 19-25 July 2013. Enter and you could win a spot at Europe's premier summer school. Take your pick from Advanced Fingerstyle with Stuart Ryan, Blues with Gianluca Corona, Groove Empowerment with Jason Sidwell or Jazz with Dario Cortese. Visit the official competition entry page to be in with a chance of winning. Read more about each course on the IGF website, or check out the videos that follow for a taste of what to expect. 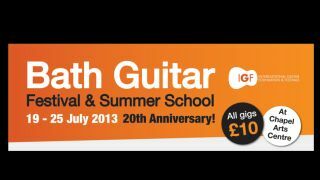 Learn more about the Bath Guitar Festival and Summer School 2013 programme of events.